Not running has made me sloth-like lazy. Yesterday I woke up at 10:30am and then still took a nap in the afternoon! My ankle is still not ready to run, but I think it will be by Wednesday according to my self-diagnosis. 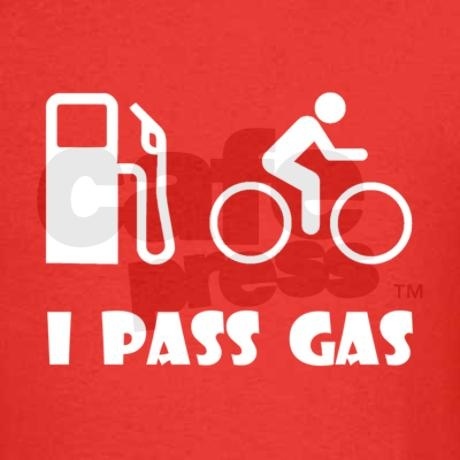 Today I will go do some light biking and see how that goes. Since I slept so much yesterday I was up and at it early this a.m. and I completed the two most important Sunday morning activities. 1. I went to the pet store to get Cecil some food. I normally order it in bulk from Amazon but its on back order. 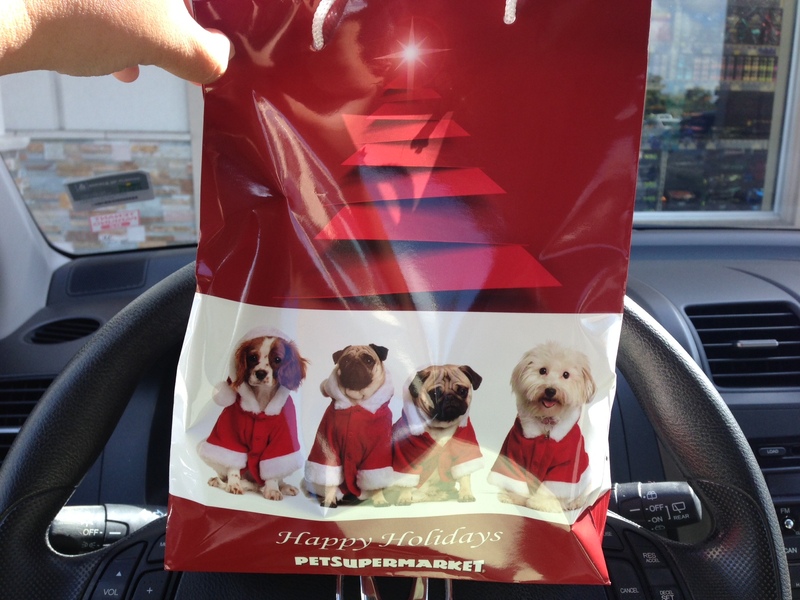 The cool thing about going to the pet store was that they gave me this super cute holiday bag! Cute doggies, but where are the Santa cats? I’m guessing they wouldn’t tolerate the clothing. 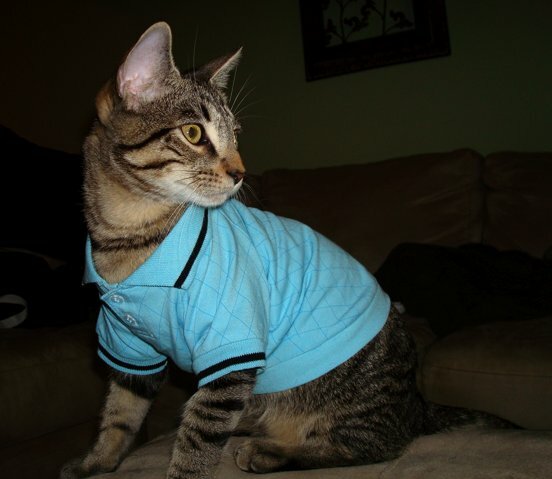 I put Cecil in a shirt once, that lasted about 30 seconds before he figured out how to take it off… and then he hid it and I never found it. I suspect that he got Adam to throw it away when I wasn’t looking. Moral of the story: don’t try to dress your cat up in a shirt that costs $30 because it will be a waste. Instead buy yourself a new shirt. Honey whole wheat bagels are the best. Hands down. 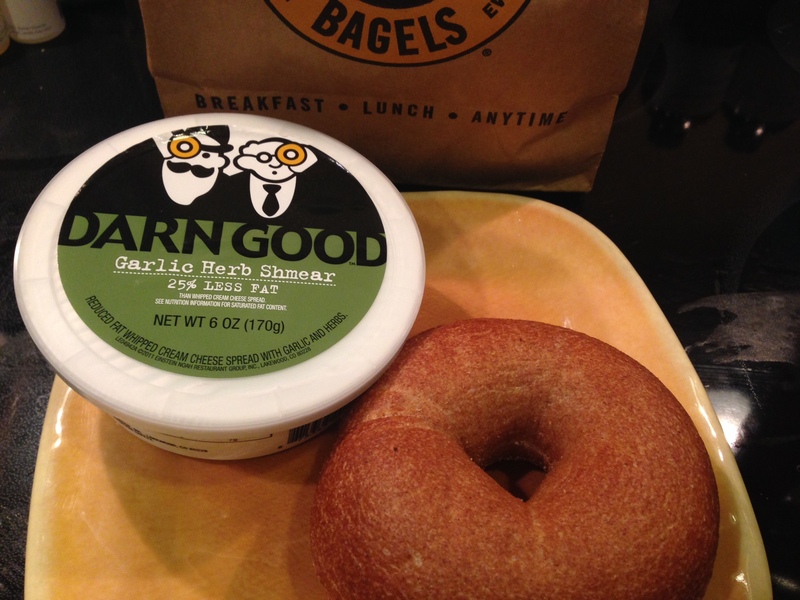 Garlic bagels are a close second. Alrighty, I am off to eat my bagel, watch football and do some biking! Have you ever dressed your pet up? – Yes, apparently I thought I was Paris Hilton. Next Post Cross Training, Dumbledore and Red Dots! In my experience (limited, of course) pets and clothes do not work. But I have heard that doggies who were dressed up from the time they were puppies do not like to NOT wear clothes. Well, my friend with a mini yorkie swears her dog cannot wear clothes. I hate how taking time off from running begets more time off. I’m in the sloth-like laziness phase too. But I have a night run planned with a group tomorrow, so that’ll get me back on track! Hope your group run today went awesome! !